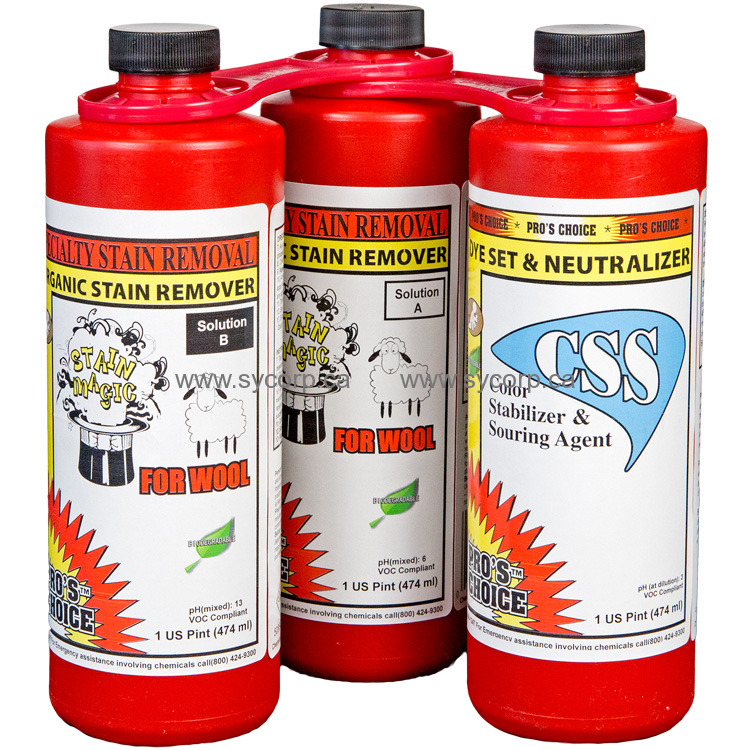 Stain Magic for WOOL is formulated specifically to remove organic stains such as coffee, tea, wine, urine, plant stains, etc from natural fibers such as wool and cotton. Natural fibers are easily damaged. Be sure to test your procedure in an inconspicuous spot for suitability before use. In a clean beaker mix equal parts solution “A” & “B”. Thoroughly hot water extraction rinse stained area with clear water. Blot area dry with clean white towel. Since the colors used to dye wool are often very easily damaged, apply “Pro’s Choice CSS” using an eye dropper to just the colored fibers you wish to protect. Using an eyedropper apply Stain Magic for wool solution to stained fibers only. Observe the stain and allow up to 15 minutes dwell time for stain to fade away. As soon as stain has sufficiently faded proceed to step 12. If stain HAS NOT faded sufficiently within 15 minutes proceed to step 8. Cover stain with a damp lightweight terry towel folded in half. Apply steam heat from steam iron set at lowest steam setting. Allow ONLY 3 seconds dwell time before you remove heat and check stain. If stain has not faded sufficiently reapply heat for another 3 seconds. It should not be necessary to repeat this process more than 2 times. Saturate area to neutralize with a dilute “CSS” solution (3 parts water to 1 part CSS).